25 yard Roll-on Roll-off skips are the best choice for commercial and industrial operations that produce vast amounts of waste. It is the second type of Roll-on Roll-off skips available in the UK, and it is an excellent choice for getting rid of massive amounts of rubbish. The 25 yard skips regularly cost from £320 – £380. But prices of skip depends on other factors such as location, permits and accessories. So it’s best to ask for quotes from the skip hire you will hire. 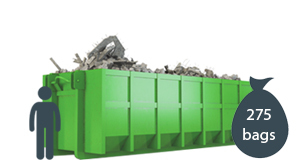 Skips are excellent for disposing of any types of waste. However, you have to keep in mind that there are some items prohibited in skips. Here’s a list of those items. 25 yard skips are commonly used in industrial operations and the construction industry. Because of their vast space, they are an excellent choice for getting rid of bulky and heavy materials produced on constructions sites. The typical price of Council permits ranges from £15 to £60. They vary depending on the council, so to make sure, inquire about permit prices on your location. If this size does not meet your requirements you may wish to upgrade to the 30 yard skip.